Kathy Ellen (who knows all the good books!) told me I would like this book if I liked walruses that waxed philosophical. Of course I had to read it. 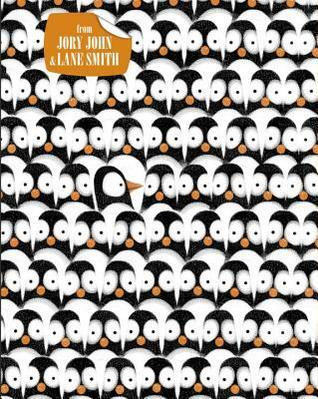 And no, there is no title on the front, just penguins. Which confused me because sometimes I’m, apparently, overly conventional. Would I recommend it? Yes! I laughed out loud the first time I read it and the girls keep returning to it for a bedtime book. The only drawback is when they went to bed tonight they tried to tell me they had “penguin problems” and they couldn’t possibly go to sleep! I admit, I feel a kinship for this grumpy bear. I am not so grumpy that I dislike sunny days and cute little animals (well at least not always), but like Bruce the bear I am rather fond of looking up recipes on the internet, I harvest local honey and I never eat my eggs raw. And, like Bruce, I once thought that I didn’t want goslings. And I, like Bruce, have also been followed around by ridiculously, stinking cute goslings until I loved them… even when they became grown up geese. Bruce might be a grump, but I like him too. 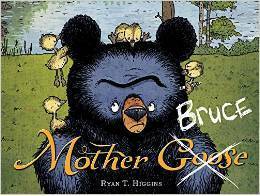 Once again there is a picture book in the house that has me pulling books out of unsuspecting visiting grandmother’s hands in order to replace it with this one. 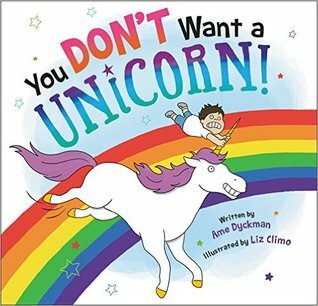 Because if you are visiting this week and you are only going to read one book to the girls, this is the one you want to read. 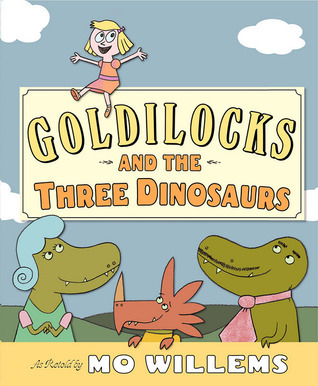 Of course this is a retelling of the classic Goldilocks story. I’m sure you remember her, she’s that blond girl that never “listened to anyone or anything.” And while I can practically guarantee adults and children alike will enjoy this book, if you can work on your evil Norwegian Dinosaur laugh you’ll really bring extra life to the story. Would I recommend it? Yes! Mo Willems has many good books but I think this is one of his best. Sort of like the sly, clever, smart fox (his words, not mine) in this book, I always have a plan. I’m a planner. I change my plans. I amend my plans. I make new plans. But there is always a plan. The fox is plotting a way to get some grapes and it’s trickier than expected. Undaunted, the fox keeps making new plans. I like this about him. But he also causes himself all sorts of extra difficulties because he doesn’t listen to the other animals who try to help him out. Never a good thing. I like to think I make better plans and listen to other people better than the fox does. But John has taken to adding, “voila!… Grapes!” to the ends of my more complex ideas and “No grapes.” when things don’t pan out. Would I recommend it? 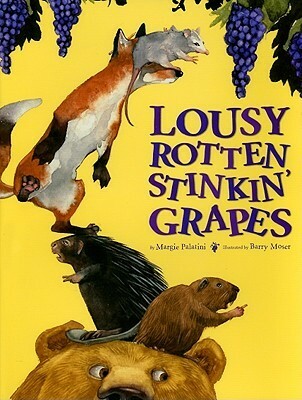 It’s my current favorite book to read out loud. It’s got phrases that have worked their way into our daily vocabulary. But, I have to tell you, it has a porcupine that claims to be able to shoot it’s quills. It hurts me to read that to my children. I have to stop and remind them, porcupines don’t shoot their quills. But, I love the rest of this book so much I’m willing to overlook a quill shooting porcupine, it’s that good. 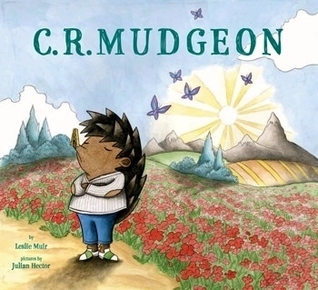 C. R. Mudgeon is a hedgehog! C.R. Mudgeon gets a new peppy squirrel neighbor named – Paprika!